First blast on the Fox 105 and the Reflex8 6.2m. A windy NE'er yesterday - the weather station was recording gusts in the mid 30's (knots), and very crazy confused chop over near Berkeley. The Fox was brilliant! Very stable, comfortable and just scooted over the rough water. It would have been survival sailing through that stuff on a slalom board, but the easy manners of the Fox quickly allowed my confidence to rise to attack the water a bit more. It is exactly what I was hoping for in the board - fast but not manic, easy to gybe and comfortable across the chop - important for old knees!! The Reflex8 6.2m was a bit more difficult! It rigged easily and looked a million dollars on the grass, but I had a tough time getting the inducers to rotate properly - a kick of the bottom inducer helped matters, but still not great. After the initial bit of sailing I had a rest break and applied about 1-2 cm more downhaul (now at spec - usually it takes a few sails for this to happen) and that improved things quite a lot. I think I need to remove the one spacer from all inducers that were in place straight out of the bag to fix the issue. Previous Reflexes need more spacers not less so this is a bit of a difference. In the gusty winds the sail felt great and delivered the power in a controllable manner. Also a special mention to the UFO weed fin I was running for the first time - a 28cm 50 degree with a front overhang. It clung on through the rough stuff without any moaning and was slippery through the water - very impressive. Orange is the new Black...? Looks a nice setup Glen. 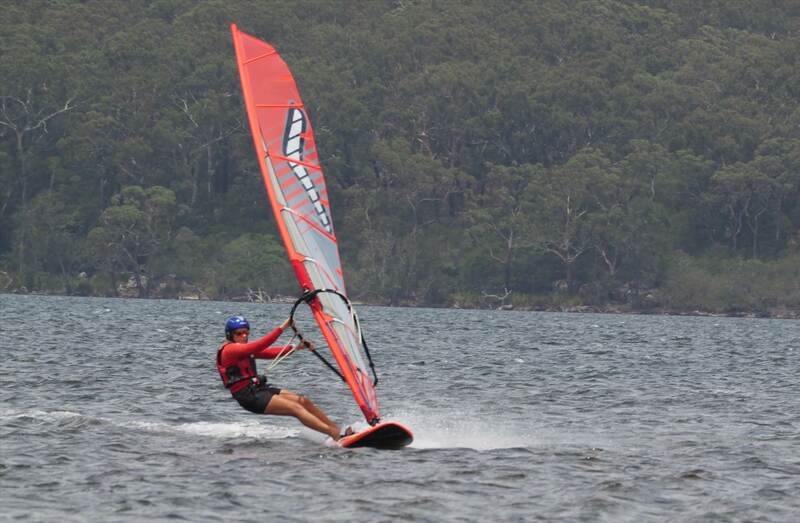 Might be a winner in the freerace comps in rough conditions? Have you weighed it? nice report Glen, how would you rate it for new cal waters now you know them ? as I just smashed my 115 on a turtle I was wondering if a fox would do the trick ? Hey Dean, not weighed it - not the lightest board but seems to be super strong construction. Nice sail Dezza! Fun sail today - I removed the spacers from inducers 1,2 & 3 of the R8 6.2m and the rotation was very good. Problem solved! Hey Sean, I've only sailed the board in choppy water, and it performs very well in these conditions. It is not the fastest board out there but it has a good turn of pace. It's advantage is being able attack the conditions when with other boards you might be backing off. I reckon a normal slalom board would be better at Ilot Maitre, but at Anse Vata and the crossing I think it would be wicked! 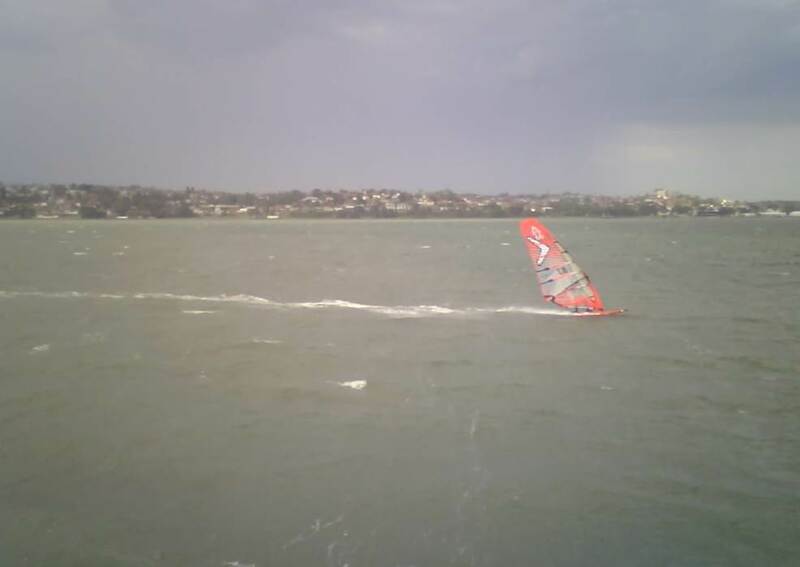 Caught by the Lake Illawarra weather station web cam today - Fox 105 with R8 6.2m in 25 knots or so! Great photo from the wind cam Bushy! That's weird .. it doesn't really look 25 knots in the photo. From those white caps, I would have guessed about 17 knots. I would usually sail a 4.7 and 85L waveboard in 25 knt conditions and I dont think I would get planing based on that photo. I had a quick look at the obs ... is this the right time & place? My guess may have been a knot or two on the high side. I do like them a lot, but I'm worried the blue might not match my old knees !!! Your guess based on the whitecaps was pretty good. It was a far bit windier earlier on though. Thanks Bushfire for the report. It sounds the goods. Only the very best sailors seem to be able to sail fast in chop. That size is perfect as well. I think the Fox could be a great medium size board for me as well as being less fragile for traveling. Stylin' Dezza, the new go fast girl!!! Gotta love the marketing blurb . This board makes think of my 2014 Exocet Scross 105 (same overall spec @ 239*65) and exact same feeling through ocean swell/chop, super smooth. No idea about speed compared to slalom board as I dont use any.